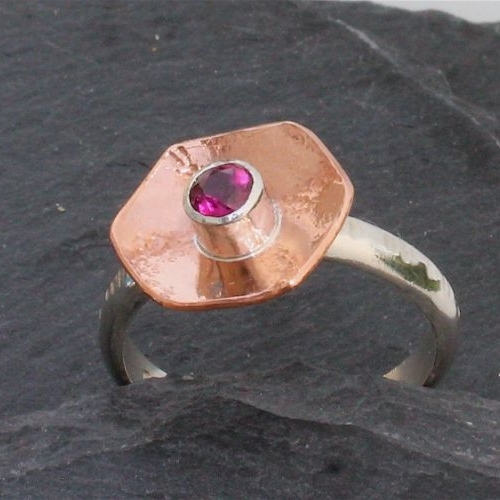 Pink Gemstone Ring is made using solid sterling silver ring and setting and a 3.5mm sparkling Rhodolite Garnet semi precious gemstone, which is framed in a texture Copper hexagon flower. It has been handcrafted in the workshop by me so is exclusive to JBJ. The solid sterling silver ring band measures 4mm in width and the copper flower measures 14mm at its widest point the sterling silver setting sands approximately 5mm proud of the sterling silver ring band. 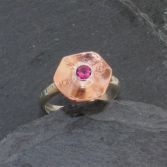 I have only made one of these rings and it is a size N1/2 however it can be made to order in a different size or with a different gemstone. 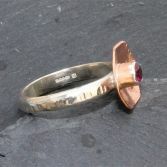 Your Pink Gemstone Ring has full UK hallmarks stamped at the Edinburgh Assay Office, all my sterling silver is sourced from a reputable UK bullion dealer. 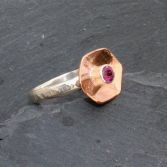 Your Pink Gemstone Ring will be presented in one of my signature gift boxes and posted via Royal Mail 1st class delivery (signed for) to any UK address free of charge.